We recommend that you use CloudFlare.com DNS service. It is free and suppots CNAME DNS record for root domain. Log in to your CloudFlare account, enter your domain name (eg.my-domain-name.com) in the box, then click the "Add website" button. Afterwards, click "Continue setup" to edit the domain. 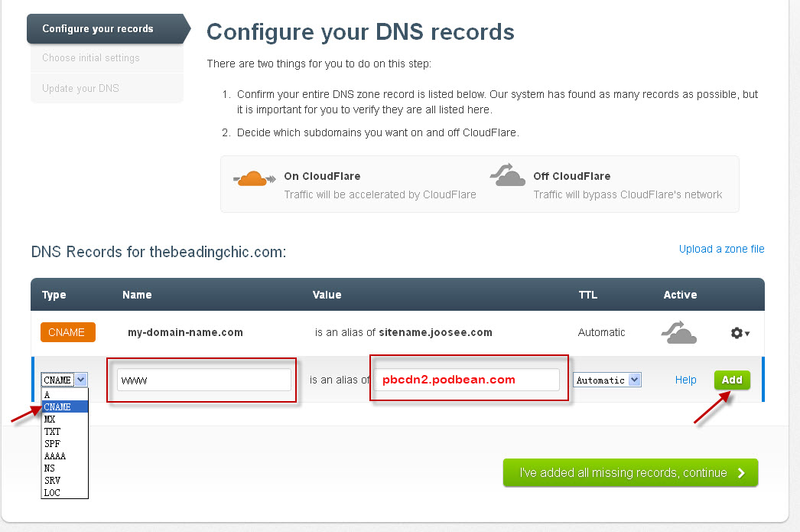 On "Configure your DNS records" page, you need to first delete the "A" records for both your root domain and www. To delete an "A" record, click the setting icon on the right side of the "A" record and then choose the "Delete record" option. To add a CNAME record for your root domain, do the following: select the "CNAME" option from the "Type" drop down list, then fill in your root domain (e.g. my-domain-name.com) in the "Name" field, put "pbcdn2.podbean.com" in the "Value" field. Finally, click the "Add" button. 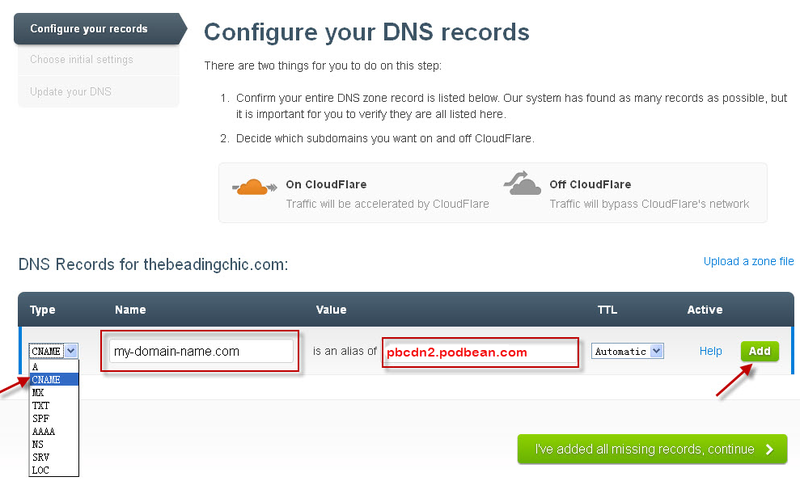 To add a CNAME record for your www.my-domain-name.com, do the following: select the "CNAME" option from the "Type" drop down list, then fill "www" into the "Name" field, put "pbcdn2.podbean.com" in the "Value" field. Finally, click the "Add" button. After fill the CNAME records, click the "I've added all missing records, continue" button. Then select the free plan. After you select the free plan, it will show the following 'Downgrade Warning“, just click the "OK" button. Then, you will have the DNS servers information listed on the page. 4. Now go to your Godday account to change the DNS servers to the ones given in CloudFlare.com as in above step. Go to your Godaddy account manage domain page, in the "nameservers" section click the "manage" link. Select the "Custom" option, the click the "Enter custom namservers" link. Fill the name servers that you get from CloudFlare.com, then click "OK". You CNAME DNS settings are done now. Please note that nameserver changes can take up to 24-48 hours to fully propagate.